This is Scrubbie Bee, and Christina asked me to share this with you all. He is made from a rolled up washcloth, a copper pan scrubber (like Chore Girl) and a black chenille pipecleaner. With large glue dots I added some wiggle eyes and a black pom pom for the nose, and it makes a cute gift. 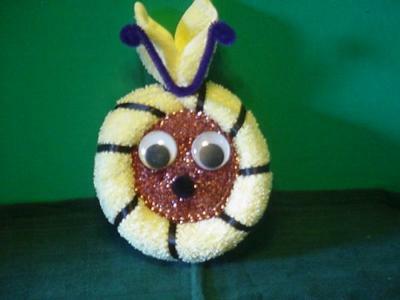 The eyes and nose pull off easily, then untwist the pipecleaner and you have a useful washcloth and scrubber. This is the kind of gift that can make a chore seem fun. You could add this to a card as a "Welcome to your new home..." for newly weds, or for someone who has just moved. It could be adapted with other household products that we all use. Add the washcloth to a bottle of washing up liquid and add the googly eyes to make a face. The pipecleaner could be a moustache. You could have some fun just making up these gifts into little characters. It makes everyday items a fun gift and the recipient is sure to be amused. Thanks Linda for this cute idea. These aren't cards of course, but Christina asked me to share these with all of you, so here goes. Sixlets are little chocolate candies much like M & M's that come in a cellophane tube and I've made two of the little toppers for each pack. I attached the cellophane tube with tape, then glued the two toppers together. These are fun little handouts to keep in your purse to give to your doctor, nurses, waitresses, store clerks, and of course to grandkids, nieces, nephews, etc. If you have children in school, they are fun to put in their lunchboxes. I love these characters and I thought it would be good to share these with everybody, thank you Linda for adding these wonderful little treats. You may not recognise the brand name but I am sure you would be able to find something similar in your country. They are really fun and I am sure the kids will love them. You could make a large batch of these ready for a childrens birthday party and add them to goody bags for each guest. They are very similar to the Paperclip Bookmarks that are in the Papercrafts section on the website. The only difference is the sweeties that are added. Mmmmm! I could just eat some of these now. I like having funny cards to send to friends. While surfing the web I saw wooden 2 X 4 block birds that looked similar to these and decided I would make my own patterns and make them into cards. The fold is at the top of the card. Each piece...colored base, head, eyes, beak and wings are layered on. The beak is curved to stick out a little and give some dimension. This could be a "Happy Birthday You Old Bird" or for any purpose. 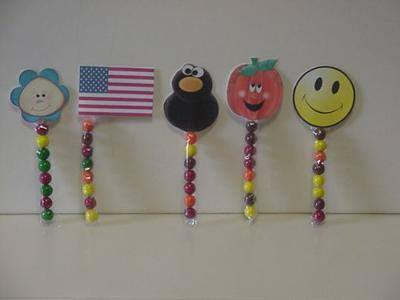 A truly fun idea to send for any occasion and one I am sure children would be delighted with. 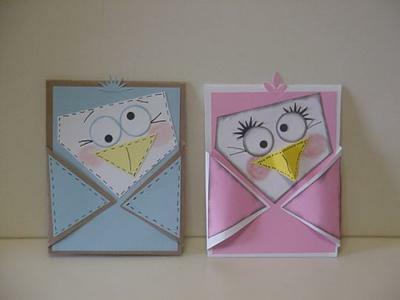 I love the idea of sending it as a birthday card with the "old Bird"....sentiment on it. I know many old birds that would really laugh at this one. It just goes to prove that you don't need to spend a fortune buying products to make some truly original cards. Just a bit of imagination and some coloured card and away you go. And your purse will tahnk you too. You will find many more "Novelty Cards" ideas for you to try in that section in the NavBar to your left. 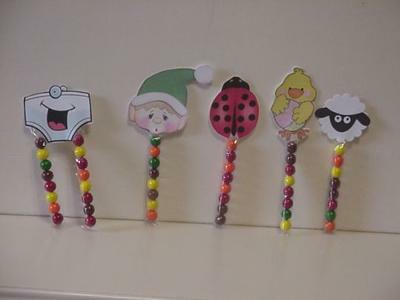 They are all easy and fun to do, to either to send, or get the kids involved in making them for their own friends. Many of them just need some oval or round shapes and it is a good way to use up your odd scraps of card. I make cards almost every day and send one to my daughter daily, as well as sending out birthday cards, thinking of you cards, etc. I love making cards. 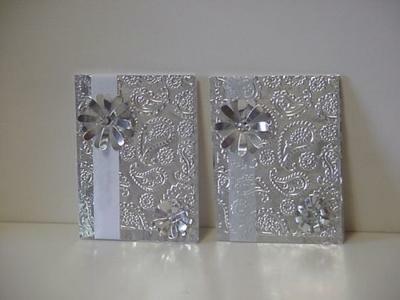 The cards shown are made from embossed tin foil (aluminum foil)....good old Reynold's Wrap. I cut a piece to fit inside my embossing folder and ran it through my Cuttlebug. I cut a piece of white cardstock the same size and glued the embossed foil to it. I wrapped ribbon around and taped it on the back. The flowers were punched from silver tape used for wrapping pipes and found at Lowes in the plumbing department. The cards can be used for any occasion. Recycling is good for us all and using tinfoil is a lovely effect. I love the use of the pipe tape to make those wonderful flowers. These cards are a real inspiration to us all to think outside the box and look for other ways to use everyday items that may be already in the home.